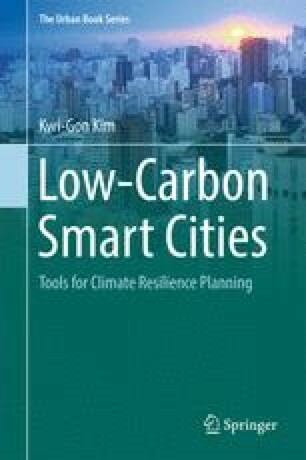 This chapter examines an integrated planning approach to climate resilient and low-carbon smart cities in terms of process and methods. Management of urban areas and their growth and spatial planning require incorporating disaster risk management and the climate change agenda as essential components of urban development. Only by merging these components and utilizing the sustainable smart planning tools available to us can adaptation and mitigation for global climate change be integrated into our future urban plans. The introduction of digitalized and knowledge-based connection of sectors or elements of a city reduces energy and other resource demands and increases safety and security. It is expected that a new wave of climate action and smart city activities powered by big data and analytics will be emerging. While many “smart” approaches can be introduced into urban planning, the use of smart grids in the planning system, by connecting the dots and creating greater synergies among all the available tools, will increase efficiency, maximize the use of resources, and bring about enhanced benefits.